Spicy combinations of color and shapes of Gemstones. 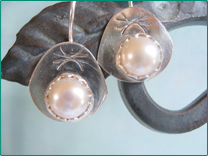 The photos shown above, and current stock of earrings on Etsy are a “jumping off place” for custom designs. Please contact Allyson with your creative ideas. Most designs are made in silver, but if you require Leverbacks, Surgical Steel or Titanium Ear Wires, please contact us here. My job is to connect each Gemstone with “it’s Person”. Magic happens when you connect! Please contact me so we can discover your perfect silver earring design and gemstone combination. I look forward to hearing from you!